Where is the Surmont neighborhood? Where is Belwood? Belgatos? Heritage Grove? Sometimes the search engines cause more harm than good when they begin to label Los Gatos neighborhoods for us. In the case of Surmont, as well as Heritage Grove, Belwood and Belgatos, that is certainly the case. Bing has published a map with the wrong answers. So let’s set it right for the good people trying to figure out what is where. 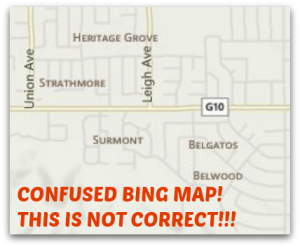 This mislabeled map puts Surmont across both where it does belong and neighboring Heritage Grove. It has Heritage Grove north of Strathmore neighborhood (which is correctly placed). Belwood and Belgatos seem to be either one and the same or north/south of each other. Of 5 named neighborhoods, one of them is correct. Where is the Surmont neighborhood of Los Gatos? Surmont starts with Westhill Drive and runs through approximately halfway between Old Orchard and Belblossom. These homes are a little older than those in Belwood and Belgatos. Many of them are custom or semi-custom, and a few have large lots with views. The streets include Westhill Drive, Surmont Drive, Surmont Court, Old Orchard Drive and Campos Verde. Where is the Belgatos neighborhood of Los Gatos? 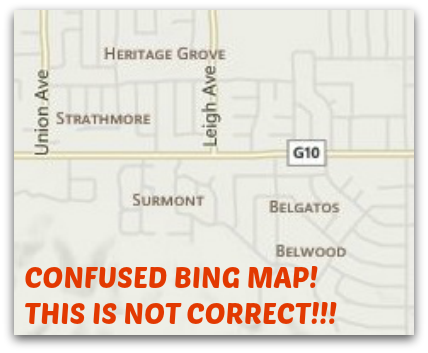 Belgatos begins with the end of the Surmont subdivision and continues up to Belgatos Road. Like Surmont, some of the homes along Westhill have bigger lots and views. These seem to be custom homes built to take advantage of valley vistas. Other houses down on the flatter area look to be semi custom in many cases. Streets found here are part of Westhill, part of Belblossom, part of Belvue, and part of Belgatos. Where is the Belwood neighborhood of Los Gatos? 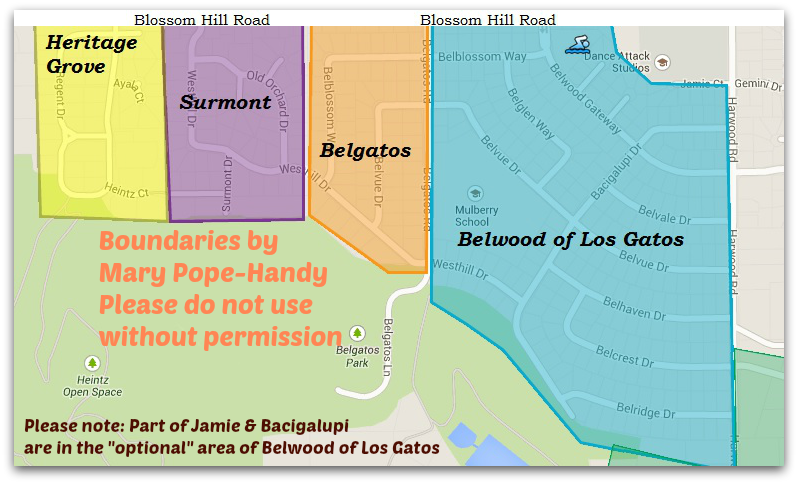 Belwood of Los Gatos runs approximately between Belgatos Road and Harwood. Some of this area was added about 10 years later (part of Bacigalupi Drive and Jamie Court behind it) and they are not part of the original Belwood subdivision. This area has optional dues and may use the pool if paying that year. The rest of Belwood pays lower dues but it’s not option. The newer stretch also has smaller lots, mostly about 8,000 SF lots instead of 10,000 SF lots. Please see the HOA’s website, BelwoodHomes.org, to get more precise boundary information for Belwood and the pool. Westhill continues into this area, though the homes appear more semi custom than Belwood generally. Most of the streets begin with “Bel” as in Belridge, Belcrest, Belglen, Belwood Gateway. Where is the Heritage Grove neighborhood of Los Gatos?